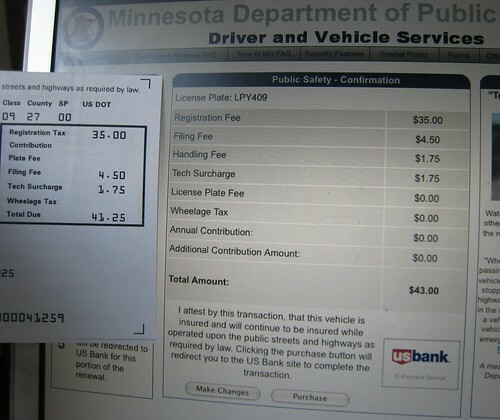 License Tab Renewals are More Expensive Online? Why does it cost $1.75 more for an online renewal than mailing in a check? At some point in history, someone with the state probably noticed that accepting credit card charges involves absorbing merchant fees. I don’t know what the state’s merchant fees are, but let’s assume they’re around $0.25 per transaction plus 2.5%, which seems reasonable. If that’s the case, the cost of processing an online transaction would be $1.28. Not quite $1.75, but in the ballpark. But rather than absorb those costs, the decision was made to pass them along to consumers. Strangely, they decided to call it a “handling” fee even though less handling is done with online transactions. Processing a check doesn’t include those hard dollar costs. Someone needs to add up the salaries of everyone involved in processing paper transactions at the state from the mail room through accounts receivable. Divide the number of paper transactions processed per year by their salaries. Is that number higher or lower than $1.75 per transaction? My money’s on higher, which would mean that we’re taxing efficiency. I’m surprised the DVS actually has a working website. It seems like the last few times I’ve checked or tried to do something online, they’ve had a notice up about upgrading their systems. What information was there looked like it was made in Publisher ’95 and updated by a third grader. Regardless, it’s T-Paw’s clueless govt. at work again. I have a little trick I use over and over when I need to deal with the DMV: I stop at the DMV in Glenwood, Minnesota, not far from where I grew up. I never wait in line (though I might have to wait for ONE customer to finish up) and I get fast, friendly service. You don’t need to go all the way to Glenwood, though. Really, just take care of your DMV business in any small town with a DMV where you might happen to be passing through or, for that matter, BY. I’ve never been required to tell ’em why I’m doing my DMV business in Glenwood, since they know my brother and they know I’m from around there, so if they think about it at all they probably think: he belongs here. No reason to ask any suspicious questions. I believe you are essentially correct. If memory serves, the DMV is able to recoup the costs of an online transaction, or something. I always head to the DMV at Sears, St. Paul. No need to pull a number and wait for it to be called if all you’re doing is renewing tabs. There is a similar fee (just $1) to change your address through the USPS online. However, you can grab the address change packets from any post office location (or print one off online) and send it in free…USPS covers the postage. Just like with the DMV, the online option requires no extra work by anyone, and the change is made immediately. Mailing it in increases manual work required, and the potential for the information to be entered incorrectly. I just got the mail to renew my tabs and was starting to write one of those check things until I noticed that you could do it online. I did notice the almost 2 buck extra fee, but I hate writing checks. They got my buck-75. The day someone in government service understand the concept (and applies) activity based costing is likely the day that said government service was privatized. Next Next post: Save Sparks Red!